Andre Kostelanetz (1901-1980) was a well-known and respected conductor who began his career in Russia and proceeded to conduct the New York Philharmonic and orchestras all over the world. 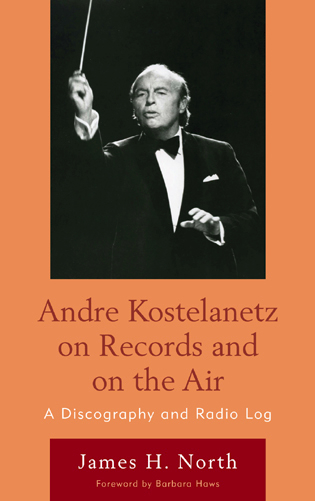 A comprehensive discography of the commercial recordings of the Russian/American conductor and radio personality, Andre Kostelanetz. James H. North has collected all his recordings, spanning the range from popular to classical. Organized chronologically by album, North provides the complete details of each recording: composer, song title, timing, date and site of the recording session, producer of that session, and matrix numbers, as well as every American issue of each recording. Several appendixes organize the information alphabetically by composer, song title, and album title, giving references back to the discography by date of recording. Available downloads from the Internet are included in the song title appendix. Two further appendixes deal with Compact Disc issues and with V-Discs, the records created by the United States Army and Navy for worldwide distribution to members of the Armed Forces during World War II. About The Author - James H. North has been a music critic for 22 years, writing primarily for Fanfare and Classic Record Collector. He is the author of New York Philharmonic: The Authorized Recordings, 1917-2005: A Discography (Scarecrow, 2006) and Boston Symphony Orchestra: An Augmented Discography (Scarecrow, 2008). All of Andre Kostelanetz's 642 Scores and 143 Programs are now publicly accessible for viewing. The Estate of Andre Kostelanetz · contact@andrekostelanetz.com · © 2008, The Estate of Andre Kostelanetz.